Think Write Thursday | If You're Reading This. …I have successfully completed the first step on a project I’ve been putting off for months: posting on my blog from my iPad. Longtime readers might recall blog posts from Sara’s post-graduation trip to Paris and Florence (back in May 2014). Those were all done from my iPad. But since then, the app I was using turned into a pumpkin and I’ve been comfortable posting from my laptop. and frankly, too wrapped up in other things to bother with it. So I’m grateful for this push from the universe to figure it out. My plan is to share posts every day while I’m here to get the hang of it. Hopefully by Tuesday y’all won’t be able to tell the difference between the iPad and the laptop. That gives me a few days to figure out the kinks, right? From my trial runs, I think photos are going to be the biggest challenge. I like to post them centered, and sometimes with a caption. I haven’t figured that out yet. But I do have two photos to share. This first is my standard in-flight entertainment shot. I cast on for a new sweater at the gate in Atlanta. The pattern is Amy Miller’s Michigan (I’m going to name my project Wisconsin). 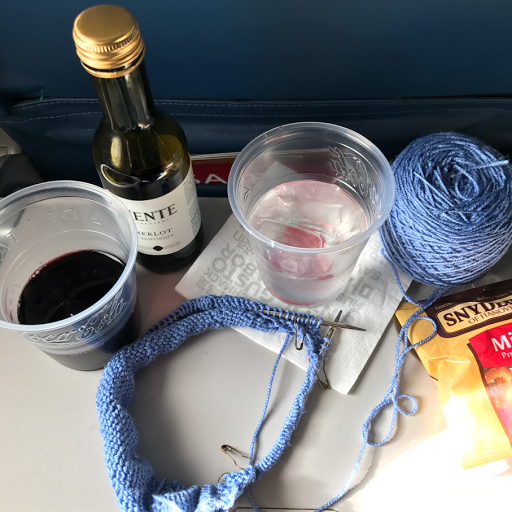 Short rows and a new-to-me centered double increase meant no book…just knitting (I even waited on the wine until I was sure I had the pattern down). And the almost landed view to the west. On previous flights, we’ve flown right over (Sara’s) Lake Wingra…not today. If I had my bearings right, it’s the shimmer off to the far right. 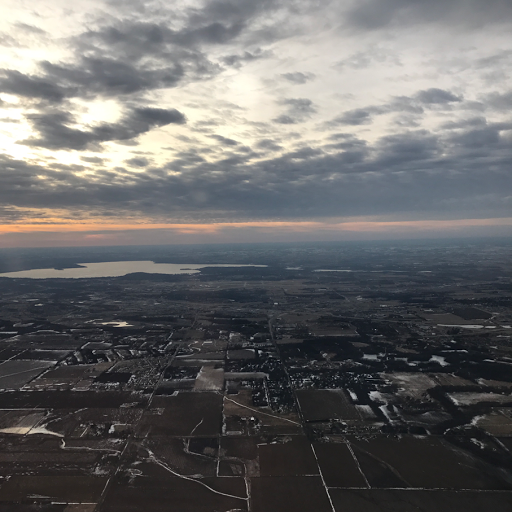 Much of the flight up was cloudy (and bumpy), so seeing the ground – even with snow! – was welcome. Hope to be back tomorrow with a better (looking) post! Have a wonderful time! Love the blue for your new sweater. Jealous about Alaska…when are you going? Well done! This is why I moved to WordPress – not sure what blogger did but it is not user friendly from iPad – so sad. Enjoy your trip and happy posting. Any chance you are stopping in Seattle on your way to Alaska? Good for you! I'm glad the timing of this topic pushed you into setting this up. I'm looking forward to reading about your adventures with Sara this weekend! Hooray, success! It looks good to me, with centered photos and everything. Your blue yarn is beautiful. Were fellow passengers fascinated by your casting on? I once wound three skeins by hand at the gate in Denver and had to laugh when this rugged-looking cowboy type asked if he could sit next to me so he could see what I was doing! It looks like you're doing well and I think you'll have it all figured out by the time Alaska comes around. Enjoy your time in Madison! I think you are off to a good start posting from your ipad. I hope you have a wonderful time with your daughter! Looks great! had you not told us, I never would've detected/known any difference. I sometimes post from my iPad/iPhone on typepad…oddly enuf: the iPhone works better… still learning the ropes with the iPadPro. Enjoy your stay…looks like the flight was fairly accommodating. Good on you-am up in the air about i-pad vs laptop. I'm hoping I won't need my laptop [for work], but we'll see. I know you'll be happy to help me along the way if I go the i-pad route! Glad there was no snow on the ground too. I love your idea of in-flight entertainment! That blue yarn is gorgeous. Have a wonderful trip. Hope it's not too cold in Wisconsin! Yay you!! That sweater is going to be awesome!